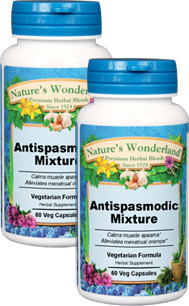 Antispasmodic Mixture - 575 mg, 60 Vcaps™ each (Nature's Wonderland) - Penn Herb Co. Ltd. This masterful combination was made popular by world renowned author, Jethro Kloss. It effectively eases muscle contraction, as well as abdominal, menstrual and intestinal cramps. Antispasmodic Mix is an incomparable blend. It includes: BLACK COHOSH, SCULLCAP…calming herbs quiet the nervous system and relieve muscle tension; LOBELIA, SKUNK CABBAGE… powerful herbs relax muscles and the respiratory passages. Black Cohosh, Lobelia, Myrrh Gum, Scullcap, Skunk Cabbage, Cayenne Pepper; Plant Cellulose (Vcaps™) - vegetarian capsules. Helpful for those affected by spasms of many kinds. As an addition to the daily diet, take 1 or 2 capsules three times daily with water at mealtimes. NOT TO BE USED DURING PREGNANCY OR WHILE NURSING.